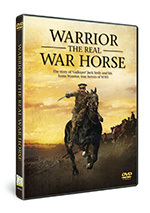 First published in 1934, Warrior: The Amazing Story of a Real War Horse, is told by Winston Churchill’s great heroic friend, Jack Seely, about how he took Warrior to France in 1914, surviving five years of bombs and bullets to lead a cavalry charge in 1918 before returning home where they rode on together until 1938; their combined ages (70 + 30) totalling 100. 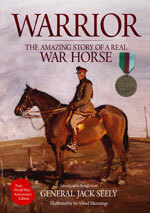 The book tells the whole history of Warrior, from his birth on the Isle of Wight to his amazing life as a famous war horse leading the Canadian cavalry and how a combination of both the horse’s extraordinary character and some unbelievable twists of fate, helped him survive a war which claimed the lives of 8 million horses. As well as an Introduction by Brough and a Preface by Sir Peter O’Sullevan, the book includes the original illustrations which equine and war artist Sir Alfred Munnings drew especially for Jack Seely both during the war and at home afterwards. Galloper Jack Seely and his horse Warrior were one of the most remarkable teams in history. The man: a famed adventurer, Cabinet Minister and close friend of Winston Churchill, who led the Canadian Cavalry in a crucial charge that helped save the Allied cause in March 1918. The horse: a uniquely brave and talented thoroughbred which Seely bred on the Isle of Wight, took to France in August 1914 and was still riding on that fateful day towards the end of the war. In this film Galloper Jack's grandson award-winning journalist and broadcaster Brough Scott takes to the saddle to explore the past. 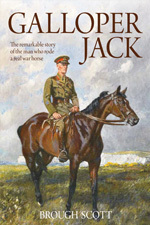 Galloper Jack is Brough Scott’s moving biography of his grandfather – the author of the best-selling Warrior: the Amazing Story of a Real War Horse. ‘Galloper’ Jack Seely was at the heart of some of the most important events of the first part of the 20th century. His early life was one of adventure, sailing to the Antipodes, saving the crew of a French ship wrecked off the coast of the Isle of Wight and later raising a squadron and joining the Boer War, where he was awarded the DSO for his bravery. be another Great War led him to embrace appeasement without questioning the Nazi regime. It was a decision that would haunt him for the rest of his life. Written with honesty and wit, this is an exciting, unusual and thought-provoking biography of a man who has been unfairly treated by history. 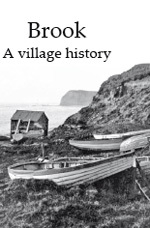 A 200 page A4 book with over 400 photographs from the attics and albums of local people together with their memories of living and working in the villages where Warrior had his home.